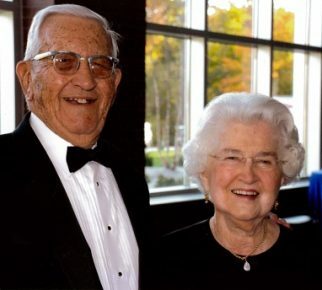 INDIANAPOLIS - Winstan R. “Bud” Sellick ’47 and his wife, Jacqueline (Blomberg) ’44, had a longstanding love for Butler University, and that affection will continue in perpetuity, thanks to a gift of $9.4 million from their estate. The gift will be shared among Butler Athletics, the Lacy School of Business, and general University support. 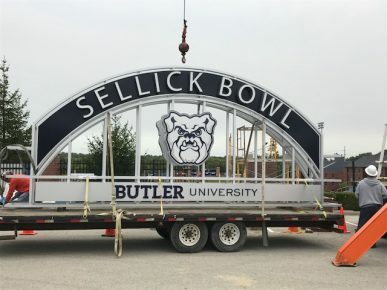 In recognition of their gift, the Butler Bowl, home of Butler football and soccer, will be renamed the Bud and Jackie Sellick Bowl. The Champions Room in the Sellick Bowl will become the Bud and Jackie Sellick Room, and the Registrar’s Office will be named the Jacqueline Blomberg Sellick Registrar's Suite. The unveiling of the Sellick Bowl will take place at the first home football game in September. The Sellicks were married for 69 years. A Marine Corps veteran, Bud served on Okinawa and in Korea. His association with Butler University was long and deep. When Bud was born, his father was the Treasurer of Butler University in Irvington, as well as a Professor of Economics at the school. In 1939, when he came to Butler as a student, an aunt was Assistant Registrar and a second aunt was a Librarian. After fighting in Korea, he returned to Indianapolis, where he served as President and Owner of Bud Sellick Insurance Agency and the Blessing-Sellick Insurance Agency for several decades until his retirement. He was also involved in a successful real estate business in the Indianapolis area with his wife and brother-in-law. They also made gifts to the Butler Fund and several athletic funds, including the restoration of Hinkle Fieldhouse. In 2007, Bud and Jackie Sellick received the Ovid Butler Society Mortarboard Award. In 2014, Bud also was honored when he received the Butler Medal. 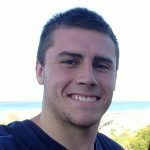 He also was a donor and strong supporter of Delta Tau Delta Fraternity. Butler Bowl to be Renamed in Honor of Bud and Jackie Sellick. 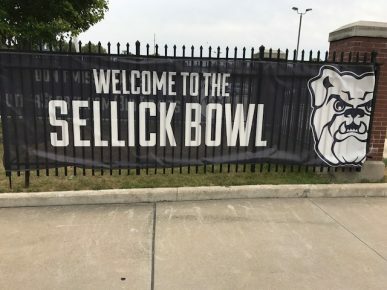 The Butler Bowl, Butler University’s longtime home for football and soccer, will be officially renamed the Sellick Bowl on September 16 in honor of Winstan R. “Bud” Sellick ’47 and his wife, Jacqueline (Blomberg) ’44. Butler President James M. Danko and Athletic Director Barry Collier will unveil the plaque during an invitation-only ceremony shortly before the 6:30 PM football game between Butler and the Taylor Trojans. The Sellicks’ generosity toward their alma mater spanned a third of a century, and it culminated this spring with a $9.4 million gift from their estate that is being shared by Butler Athletics, the Lacy School of Business, and general University support. In honor of their gift, the Butler Bowl becomes the Sellick Bowl, the Champions Room inside the Sellick Bowl is now the Bud and Jackie Sellick Room, and the Registrar’s Office is the Jacqueline Blomberg Sellick Registrar's Suite. 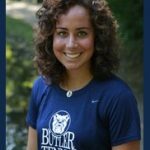 The Sellicks endowed three scholarships at Butler: The Winstan R. Sellick, Jacqueline Sellick, and Herman W. Blomberg Scholarship; the Sellick, Deming, and Schuler Scholarship; and the Winstan R. Sellick and Jacqueline B. Sellick Business Scholarship. They also made gifts to the Butler Fund and several athletic funds, including the restoration of Hinkle Fieldhouse. In 2007, Bud and Jackie Sellick received the Ovid Butler Society Mortarboard Award. In 2014, Bud also was honored when he received the Butler Medal. He also was a donor and strong supporter of Delta Tau Delta Fraternity. Stadium to be Named in Honor of Bud and Jackie Sellick. 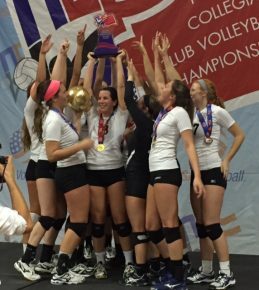 Butler’s women’s club volleyball team won the National Collegiate Volleyball Federation’s National Championship Tournament, defeating University of Wisconsin-La Crosse 25-17 in back-to-back games. Rachel Pierce and Sam Lilly were named to the women’s Division 2 All-Tournament Team, and Kennedy Flesner was named to the All-Tournament Second Team. 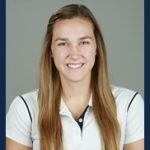 Pierce was named tournament MVP, and Meghan Riordan earned honorable mention. 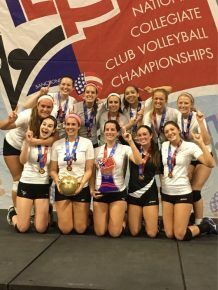 The tournament, which took place April 12-15, attracted over 440 NCVF collegiate club teams from throughout the country. The tournament featured 10 divisions of competition, with 1,683 individual matches played on 63 courts over a three-day span at the Kansas City Convention Center. The entire tournament we worked incredibly as a team. We didn’t let teams string points together very often, and our confidence in ourselves was never shaken. Though we were in Division 2, the competition was still extremely tough. All of the other teams in the gold bracket on the last day have players on both the first and second All-Tournament Teams. We also have five freshmen on our nationals roster, and 10 on our regular season roster. So our team this year was very young and very new. They all worked very hard during the year, and I’m excited to see where they’ll take the team. As for the upperclassmen (those who are first-years), each one of them is extremely integral to the team and a leader on and off the court. 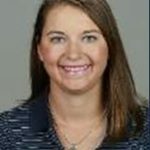 Suzie Smith runs our defense and serve receive and leads by example; Anna Taylor is one of the most vocal on the court and keeps us competitive; Kennedy Flesner is one of the hardest workers, if not the hardest worker, and leads with humor and positivity; Sam Lilly is the most caring, always trying to bring our team together; Lindsay Rhodes and Ashley Eimers somehow always get kills when we need them the most and are always ready to do whatever they need to do on the court to keep us in the game. Honestly, we’ve never played together like we did at this national tournament. It was an amazing and unforgettable way for us (and for me as a senior) to go out. It was an amazing and unforgettable way for us to go out.